Kailee and I never actually met in person, which is often the case for my out-of-town clients. They live and work in Kenora, so it just wasn’t really convenient for them to come into Winnipeg just to meet with me about flowers. We did everything over Facetime and email. I generally find that this process works really well for out-of-town couples, particularly when they trust me to do a great job for them. Kailee told me her favourite things (she really, really loves roses!) and her colour palette of blush, cream and black, and I took it from there. Originally she envisioned very classic, round floral designs but towards the end of the planning, she asked if we could loosen things up. The designs should still have a fairly formal feel, but with a looser shape that suited the outdoor wedding a little better. Ah, Kailee’s bouquet. I loved it! It was a huge, huge bouquet with a soft blush, peach, and cream palette. Bridal Bouquet Ingredients: white o’Hara garden roses, quicksand roses, and mother of peal roses with white ranunculus and calcynia. I’m telling you the truth, this might be my favourite combination. The colour variation was subtle enough for a blush palette but thanks to the really delicate touches of peach, it was more interesting than the typical blush and cream. I had a really hard time letting this one go! Can you imagine this boat as your getting ready location? I had already booked another wedding in Winnipeg for the same weekend, which meant that I wasn’t able to drive out to Kenora to deliver and set everything up for them. It’s always my preference to be able to do it myself, but sometimes with out of town weddings, that’s just not do-able! So, one of Kailee’s brothers pulled up to my place the day before the wedding. We arranged for him to bring a van, they lined up an air conditioned to keep the van cool over-night, and we packed that thing full to the top with flowers! I was actually quite anxious that there wouldn’t be enough space, as the original plan was for them to rent a cargo van but they ended up needing to use a mini-van. We played some serious Tetris that morning, and miraculously, it all fit in. I always love dock ceremonies at the Royal Yacht Club because that view is just incredible. In this case, the couple had this wooden arch made and I designed these large floral pieces to frame them in. I filled them with lots of roses, Kailee’s favourite, and they were like lush floral clouds for them to get married under. The Royal Yacht Club at Kenora has an indoor facility, but it’s not very large. Kailee and Steph erected a tent on one of the tennis courts instead, which allowed them to move from indoors to out really easily at different points throughout the evening. I designed a mix of low and tall arrangements, which were scattered on the tables and around the Yacht Club. I love the rose gold accents that Kailee brought in with the candleholders and flatware. Getting married in Winnipeg or the Lake of theWoods? 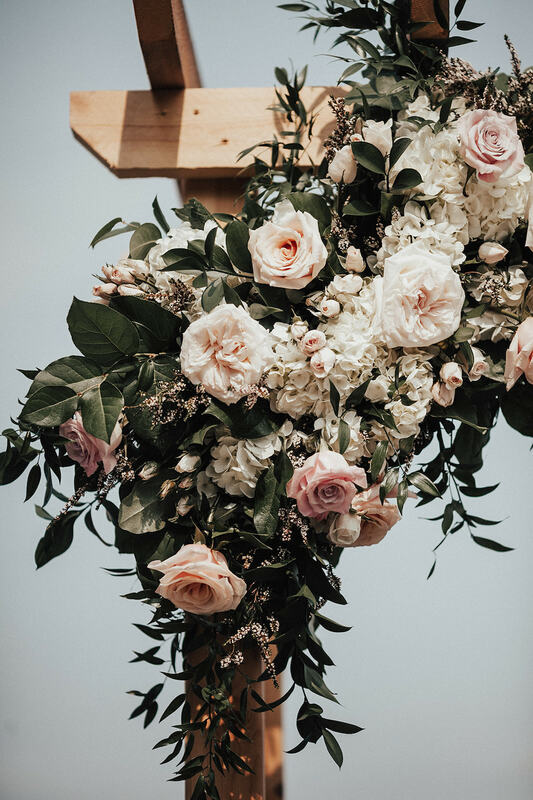 Whether it's a whimsical garden party inspired celebration or a formal ballroom fete, I think flowers are the best way to make a statement at your wedding. 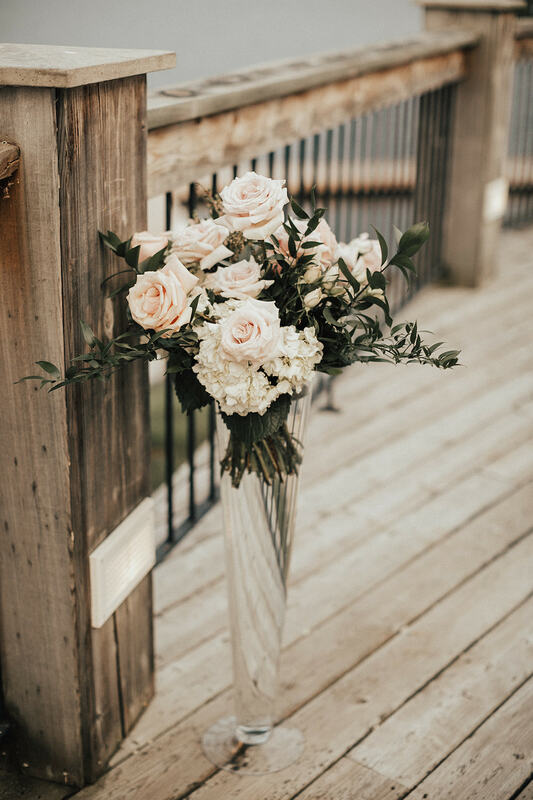 Maybe you already have a specific vision or you might want me to dream up something custom just for you - either way, reach out to Stone House Creative for stunning bridal bouquets, truly unique ceremony backdrops, and beautiful floral centrepieces to create the perfect ambiance for your wedding! 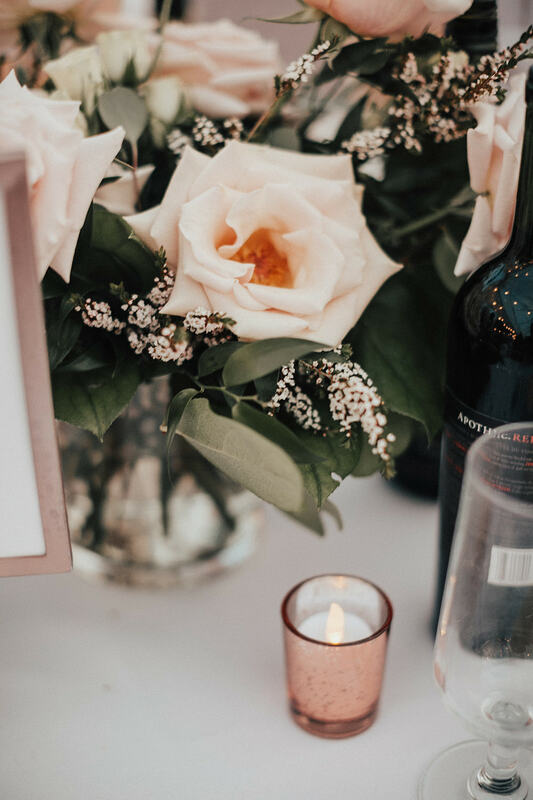 I’ll be opening up appointments for 2020 wedding dates very soon - but be sure to get on the waitlist in the meantime!